Here is a collection of old newspapers I have collected over the past few years.All of the newspapers are originals and most are complete newspapers.I started collecting these about 6 years ago and I continued to do so.Most of the newspapers I have collected have front page news that deal with hurricanes,nor'easters,blizzard and other weather related events.Hope you enjoy viewing them.Please sign my guest book at the bottom of the page and leave comments. Long Island Newsday,DEC. 1992 Nor'easter.Firemen from a flood street in City Island,NY. Minneapolis Journal,1926 Florida Hurricane. Headline-"360 known dead in hurricane"
The Petosky Evening News. 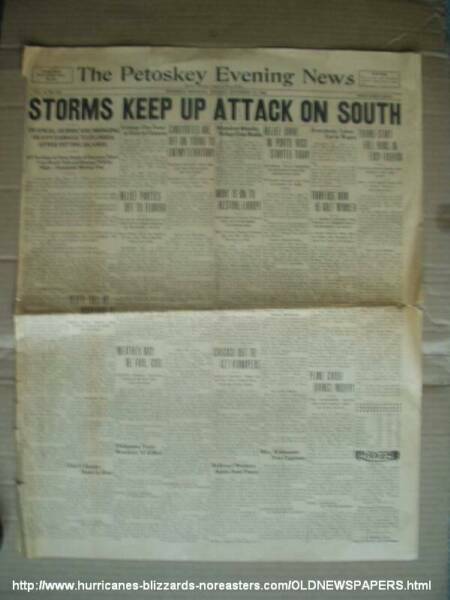 1928 Florida hurricane Headline-"storms keep up attack on south"
The Boston Post.. 1938 hurricane,worst hurricane on record to strike the northeast.Headline-"death toll in storm and flood to pass 700"
Long Island Newsday,Hurricane Hugo(1989). 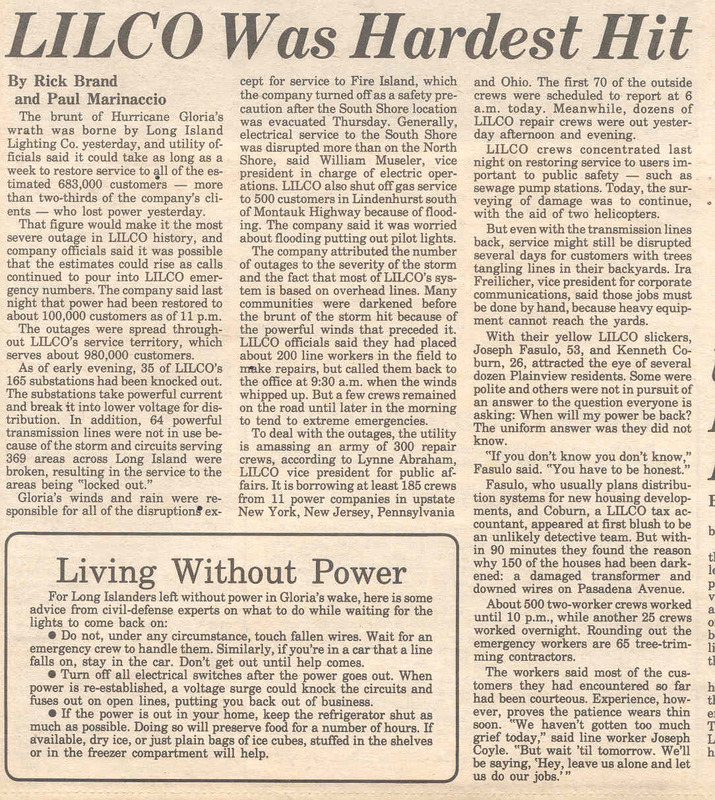 Headline "HUGO"
Long Island Newsday,Hurricane Hugo.. 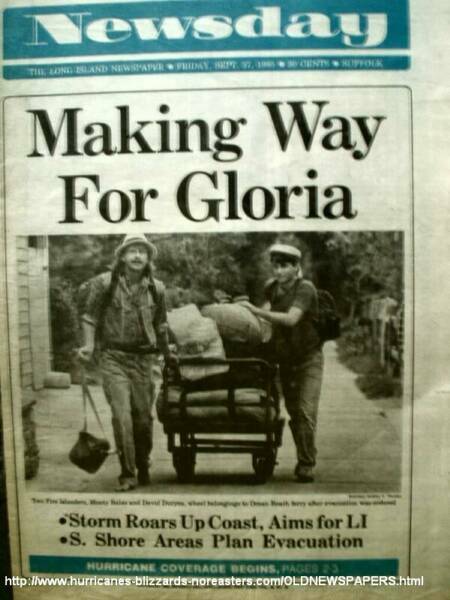 Headline "In Harm's Way"
Long Island Newsday,Hurricane Gloria 1985. 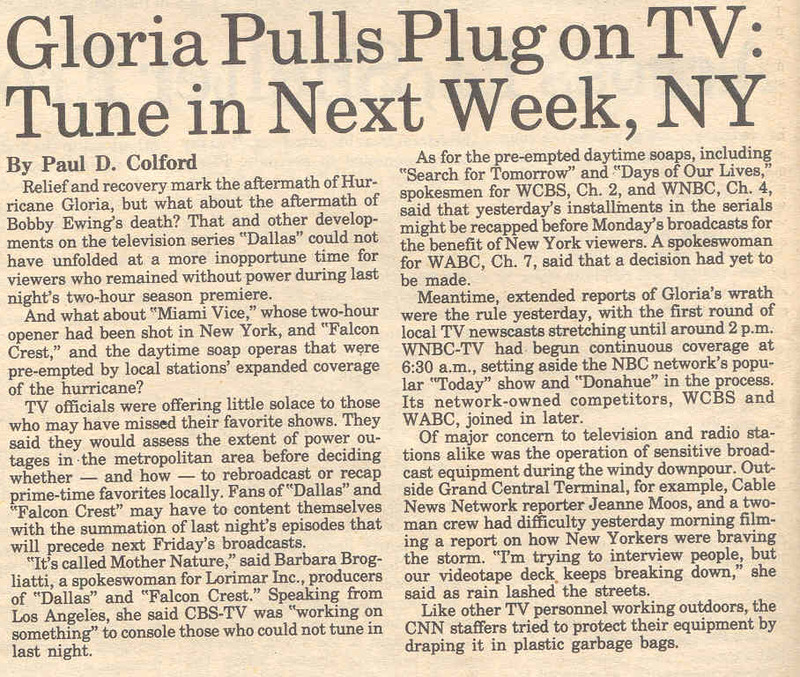 Headline 'Making Way For Gloria"
Long Island Newsday,Hurricane Gloria 1985. 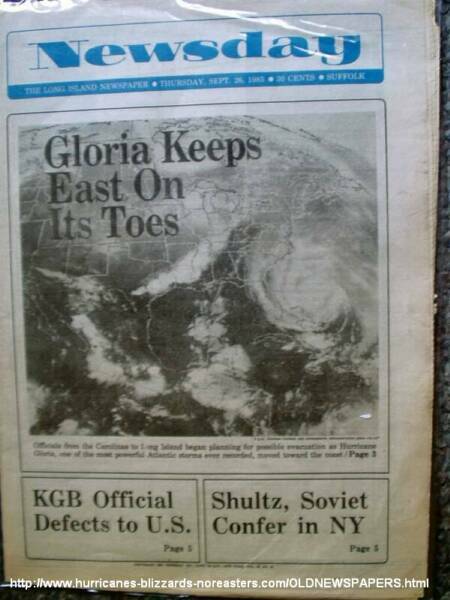 Headline "Powerless"
Long Island Newsday,Hurricane Gloria 1985. 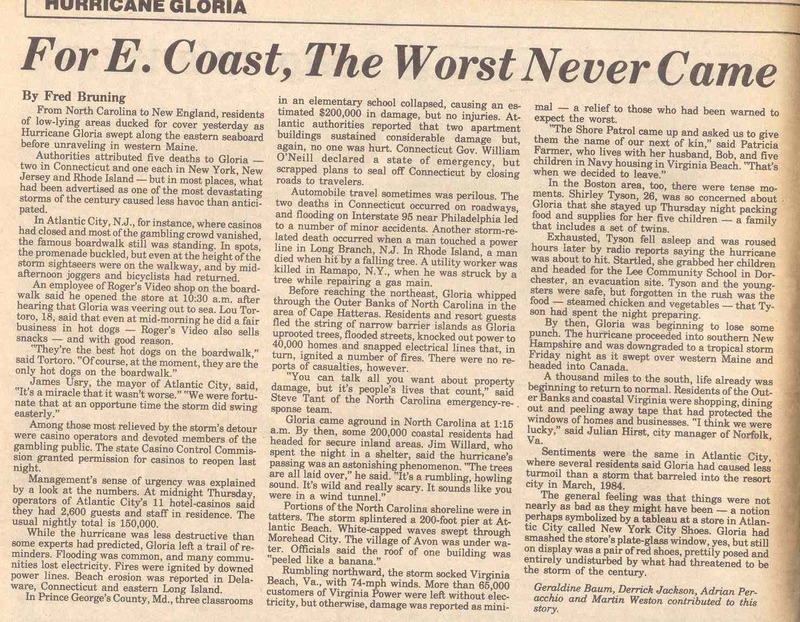 Headline "Gloria keeps east on it's toes"
New York Daily News,Hurricane Andrew 1992. Headline "RAVAGED"
Long Island Newsday,Hurricane Andrew 1992. 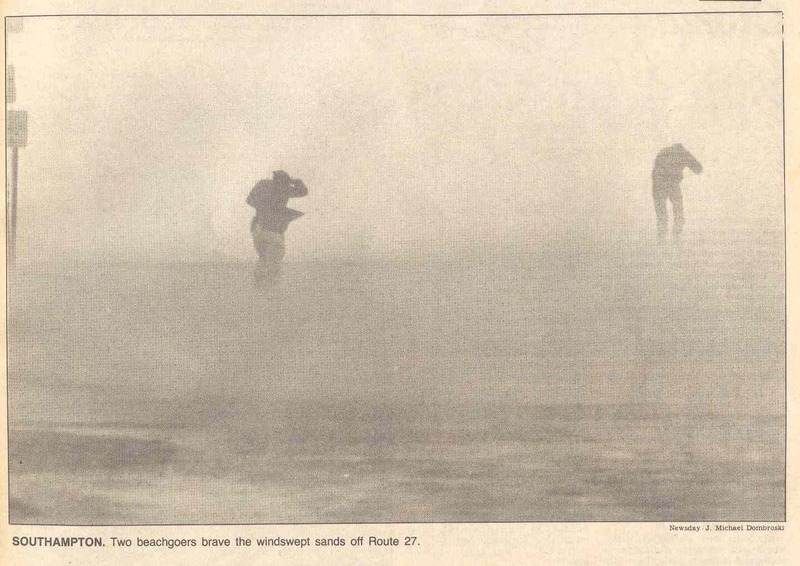 Headline "Wasteland"
Long Island Newsday,Hurricane Andrew 1992. 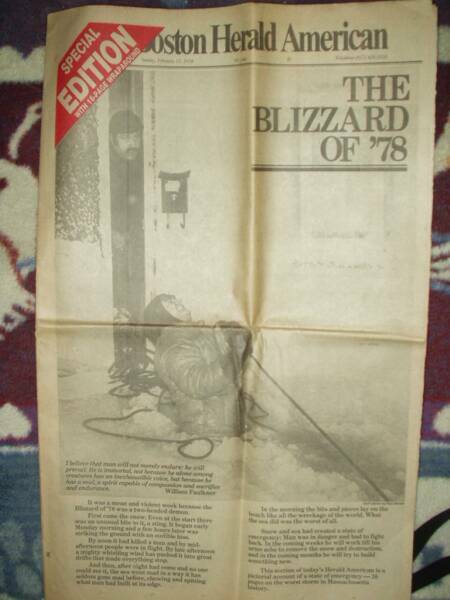 Headline "It's Back"
The Reading Eagle,Hurricane Frederic 1979. 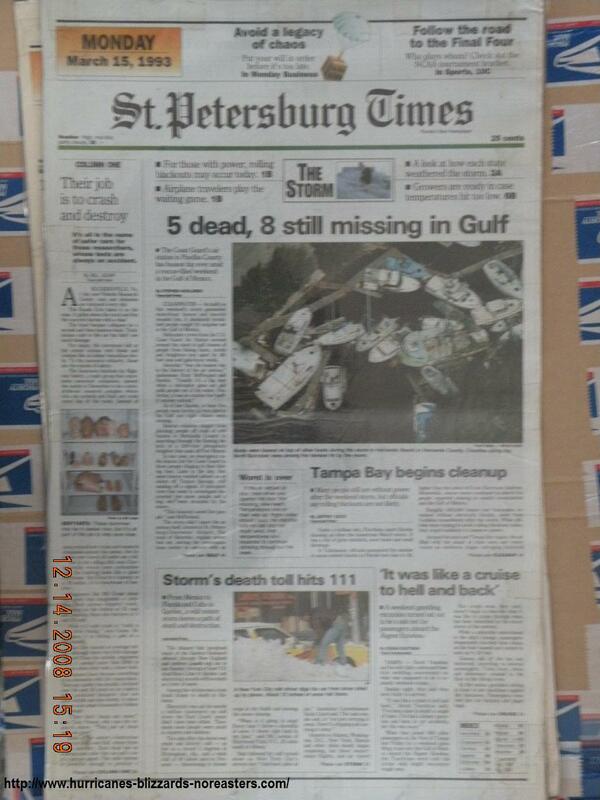 Headline "Gulf Coast Smashed"
The St. Petersburg Times,March 1993 superstorm. Headline "Big blow,big chill"
The Springfield Newspaper,1938 Hurricane. Headline "PICTURES OF THE FLOOD AND HURRICANE"
The Tampa Tribune,March 1993 Superstorm. Headline "Florida takes a wicked blow"
The Hartford Courant,1938 Hurricane.Headline-"54 Dead 20 Missing Storm Toll In State"
Long Island Newsday,Perfect Storm Oct 1991-Headline "RIDERS ON THE STORM"
Boston Daily Record,1938 Hurricane. Headline "DEATHS NOW 390"
Boston Evening Globe,1938 Hurricane. Headline "HURRICANE DEAD 250"
Boston Herald, 1938 Hurricane. Headline "STORM DEATHS MOUNT TO 515"
The Boston Post, 1938 Hurricane. Headline "45 KILLED IN WILD HURRICANE PROPERTY DAMAGE IN MILLIONS HUNDREDS HURT BY WRECKAGE"
The Hartford Courant,1938 Hurricane. 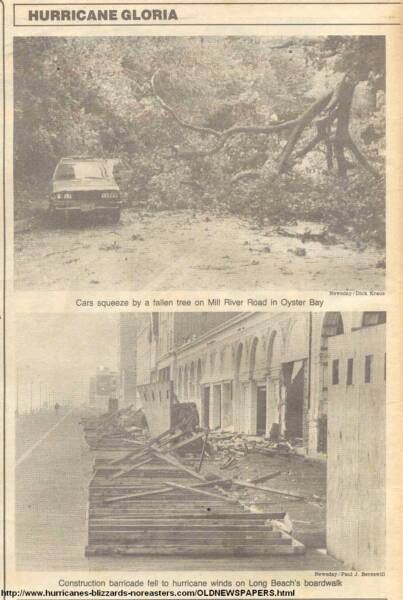 Headline "Storm Dead And Missing List Rises to 125"
Hurricane Agnes 1972. 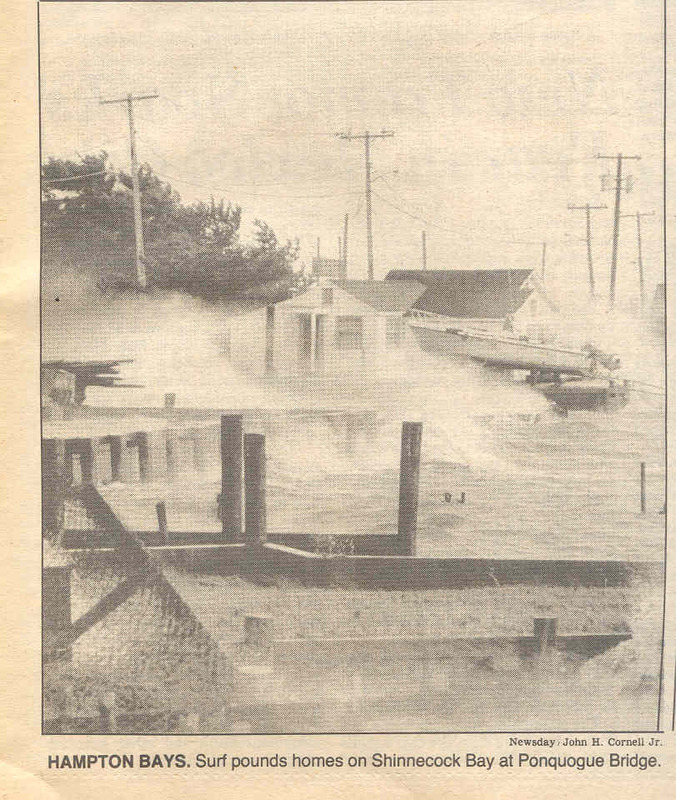 Headline AGNES,And the great flood of '72"
The Daily Herald, Hurricane Camille 1969. Headline "40 Injured In Shelter Cave-In As Wind, Rain, Tides Stun Coast"
Long Island Newsday, 1996 Blizzard. 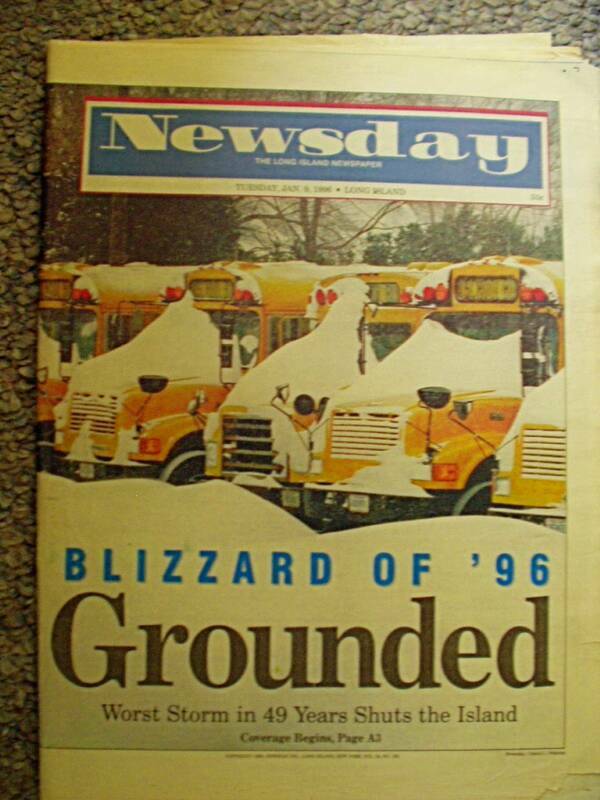 Headline"GROUNDED"
Long Island Newsday, Hurricane Charley 2004. Headline "Charley's Deadly Rage"
Long Island Newsday, Hurricane Isabel 2003. Headline "All Eyes On Isabel"
Long Island Newsday, Hurricane Ivan 2004. 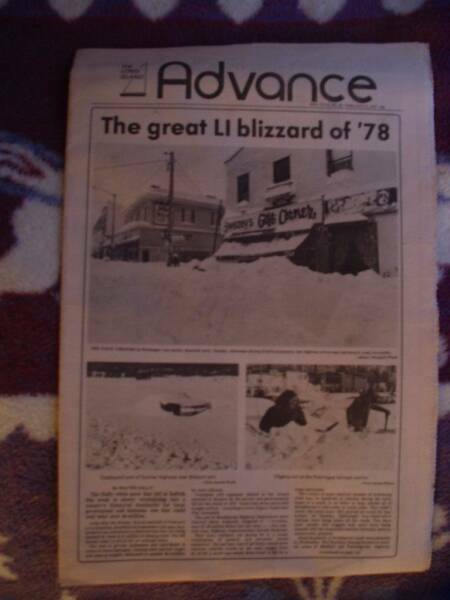 Headline "Ivan's Wake"
Long Island Newsday, Nor'easter of Jan. 1994. Headline "Winter's Wallop"
New York Daily Mirror, 1938 Hurricane. Headline "400 DEAD"
New York Daily Mirror, 1938 Hurricane. Headline "20 KILLED IN WILD STORM"
New York Daily News, 1938 Hurricane. 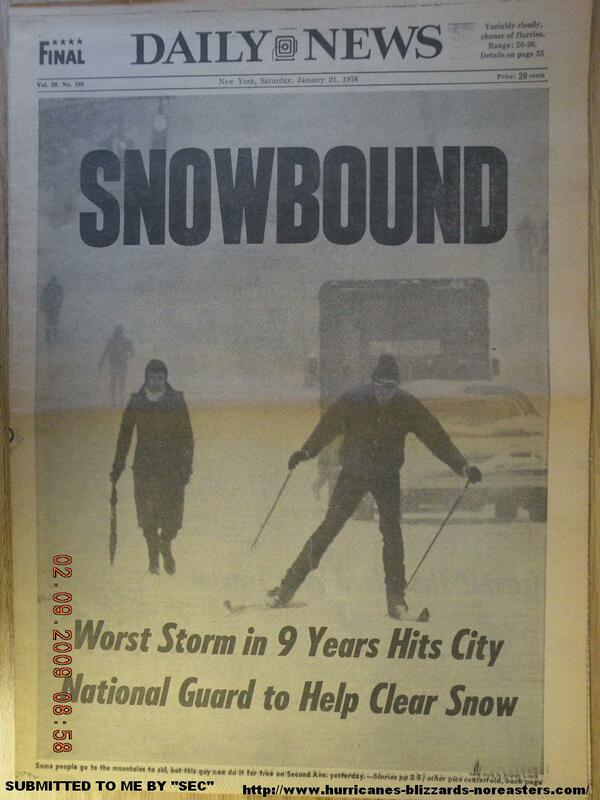 Headline "322 Dead In Storm; 37 In N.Y."
New York Daily News, DEC. 1992 N or'easter. Headline "Water Torture"
New York Daily News, Hurricane Carol 1954. Headline "HURRICANE RIPS L.I. 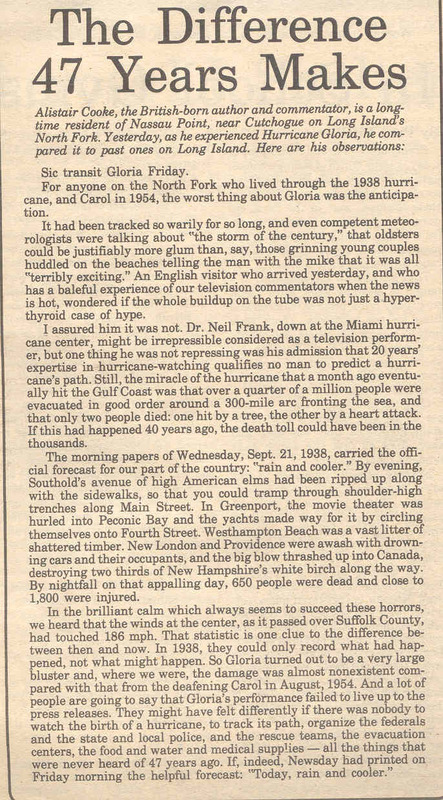 ; 25 KILLED IN NEW ENGLAND"
New York Daily News, Hurricane Charley. Headline "$10 BILLION"
New York Daily News, Hurricane Charley 2004. Headline "BLASTED!" New York Daily News, Hurricane Connie 1955. Headline "CONNIE GALE COMING HERE"
New York Daily News, Hurricane Dora. Headline "THOUSANDS FLEEING DORA"
New York Daily News, Hurricane Frederic 1979. Headline "HURRICANE FRED HITS GULF COAST"
New York Post, Hurricane Charley 2004. 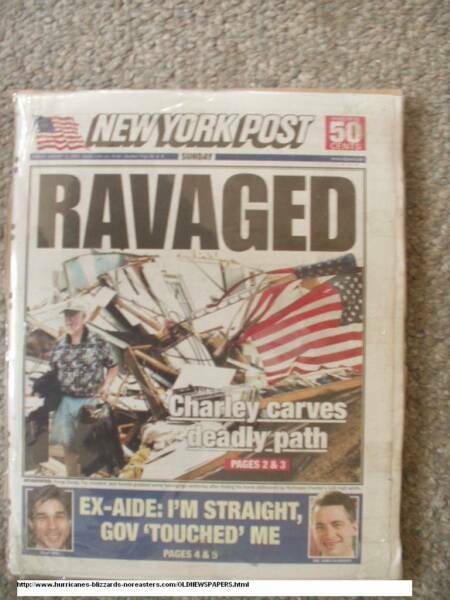 Headline "RAVAGED"
New York Post, Hurricane Frances 2004. Headline "WIPEOUT"
Orlando Sentinel, Hurricane Frances 2004. 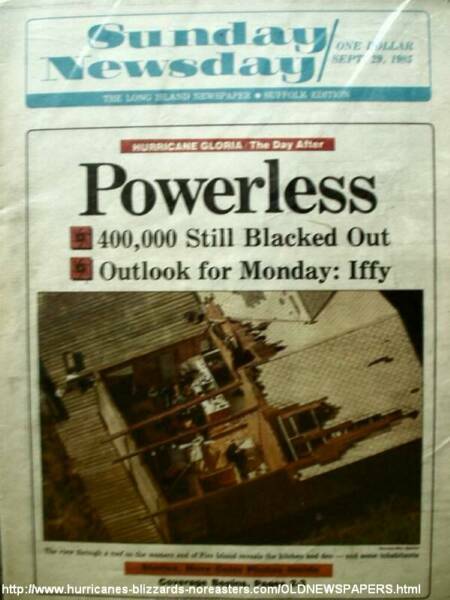 Headline "POWERLESS"
Orlando Sentinel, Hurricane Charley 2004. 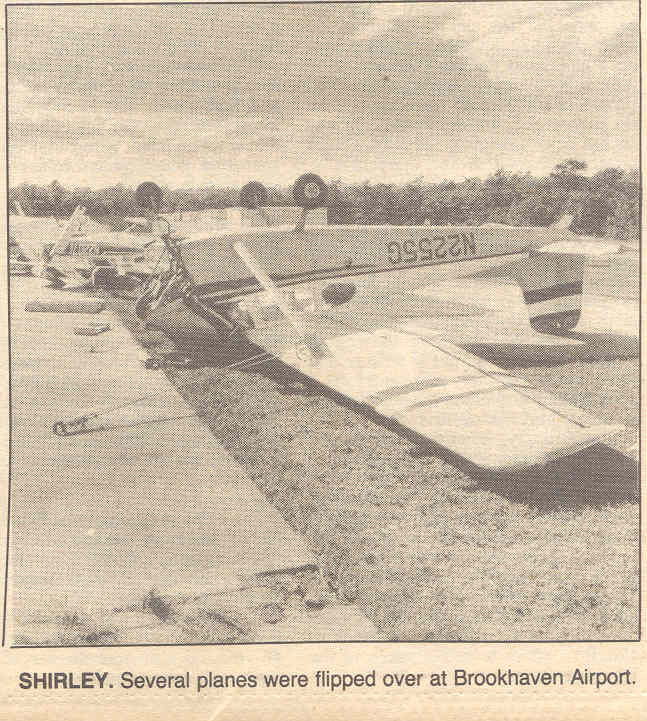 Headline "CHARLEY RIPS ACROSS FLORIDA"
Long Island Newsday, Perfect Storm Oct. 1991. 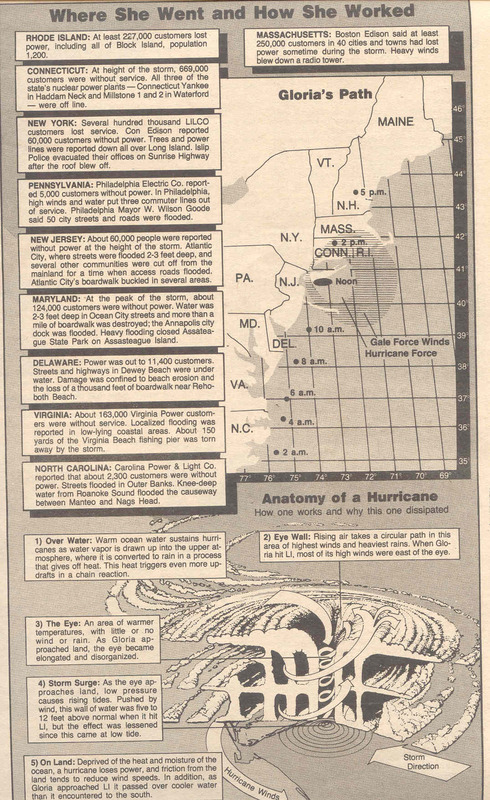 Headline "WASHOUT"
Long Island Newsday, Perfect Storm Oct. 1991. 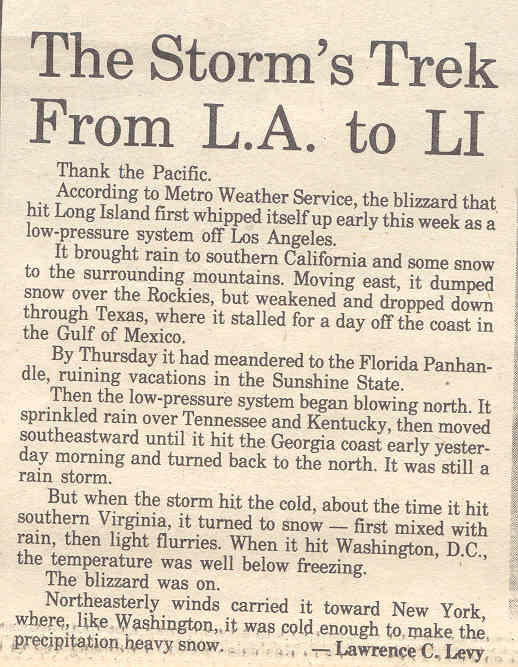 Headline "Blow By Blow"
New York Daily News, Presidents Day Storm Feb. 1979. Headline "SNEAK STORM CRIPPLES CITY"
Providence Journal, Blizzard. 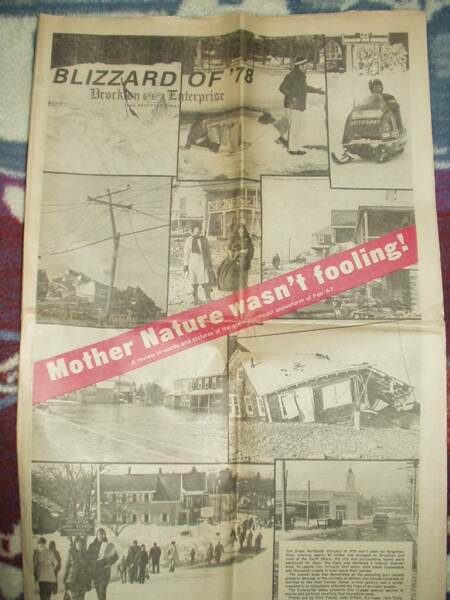 Headline "Record 18.3 Inch Snow Buries R.I."
Springfield Newspaper, Hurricane Edith 1955. 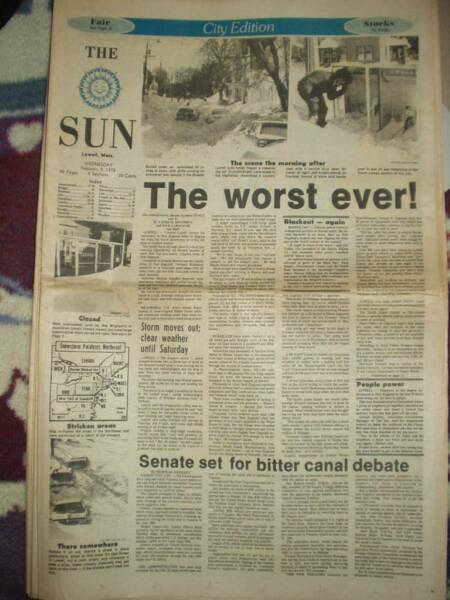 Headline "THE 1955 FLOOD"
Sun Sentinel, Hurricane Andrew 1992. Headline "Andrew bears down on S. Florida's coast"
The Houston Press, Hurricane Carla. 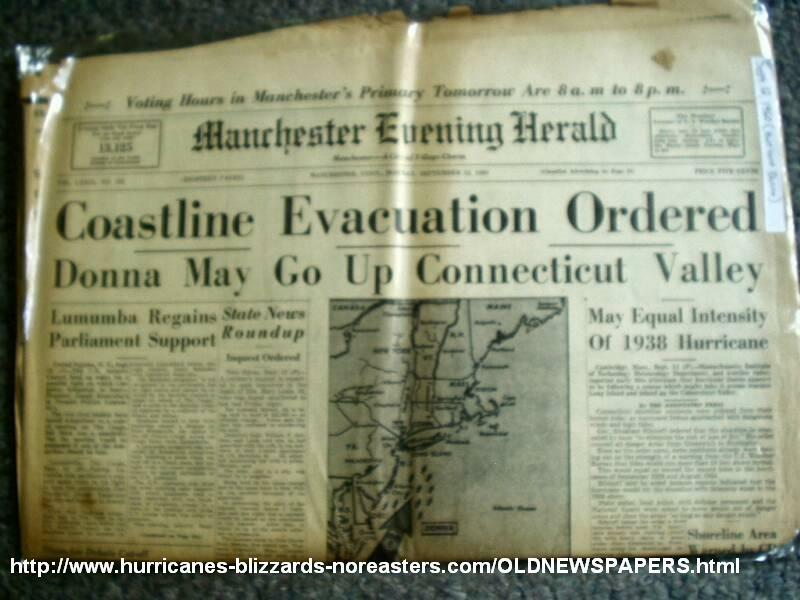 Headline "HURRICANE CARLA"
The New London Day, 1938 Hurricane. Headline "Hurricane, Flood, Fire cause $4,000,000 Damage"
The Sunday Star. 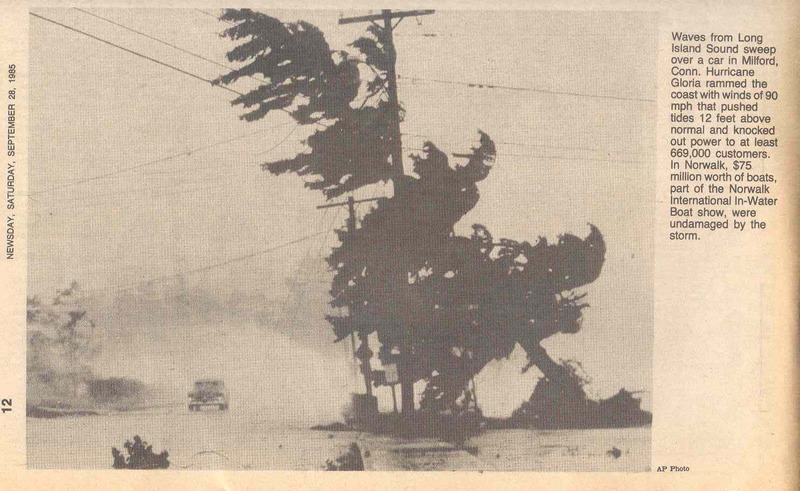 1993 Superstorm. Headline" 'Hurricane with snow' savages east coast"
The New York Press, 1900 Galveston Hurricane,Worst hurricane to hit the U.S.
CLICK HERE for a great site that has a scrape book of articles on the 2004 hurricane season. The Sun City Addition....The worst ever! Daily evening....Mother nature wasn't fooling!! MORE OF MY NEWSPAPER COLLECTION WILL BE ADDED VERY SOON.I HAVE ALOT MORE TO ADD.THEY WILL ALL BE ADDED HERE(UNDER THE 96 BLIZZARD HEADLINES)INSTEAD OF MOVING EVERYTHING AROUND IT WILL BE LESS TIME CONSUMING TO JUST ADD THEM STARTING HERE..